Museums are massive and overwhelming. They are full of incredible artifacts to discover. Every year since 1977 the worldwide community of museums has celebrated the International Museum Day on May 18. Participation in International Museum Day is growing among museums all over the world. In 2017, more than 36,000 museums participated in the event in some 157 countries. The theme chosen for 2018 is "Hyperconnected museums: New approaches, new publics". Azerbaijan, rich history, unique culture and heritage, is full of amazing museums and galleries. Here we are listing the most amazing and unusual museums in Azerbaijan. Carpet weaving is one of the most significant and ancient kinds of Azerbaijani applied art, traditions and secrets of which were carefully preserved and passed down throughout generations. Established in Baku in 1967, the museum can familiarize you with the unique examples of the national carpets. The museum itself is beautiful inside and out. A new carpet museum, designed in the form of a rolled carpet, opened in the Baku Seaside Park in 2014 and all carpets were transferred to this museum. Follow step-by-step the country's history in the Azerbaijan National History Museum. National Museum of History, located in the former mansion of Azerbaijani oil magnate and philanthropist Haji Zeynalabdin Taghiyev is the largest museum in the country. The museum’s exhibits include the artifacts discovered in Gobustan, Azikh cave, Kamiltepe, Geytepe as well as Karabakh and Soyugbulag mounds. Over 300,000 items are assembled in 10 collections in the museum, including a valuable library consisting mainly of unique books. The collections allow visitors and researchers to investigate the history of the country and the daily life and culture of the nation from ancient times to the present. Today the museum is a large scientific center. There is a lab for restoration of rarities, production group and research committee on exposition completion. Azerbaijan is also home to major contemporary art museums. 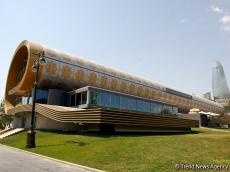 In March, 2009 with the support of the Heydar Aliyev Fund the Museum of Modern Art was opened in Baku. The museum does not have fixed subject areas. The architectural concept of the museum avoids halls with corners and has open passages and walls that meet at different angles, creating a multidimensional perspective of exhibits. The museum's exposition also has products of great European masters – founders of avant-garde style in the world art – Salvador Dali, Pablo Picasso, and Marc Chagall. The classics of the western realism are presented by several pictures from private collection. There are a number of theaters in Azerbaijan. Theatre development in Azerbaijani culture has a very rich history, which begins with the theatrical elements of open-air folk performances, religious ceremonies and much more. History and development of Azerbaijani theater requires a separate story, since namely in this county the first theater and the first opera was staged in the Muslim East. The theatrical art of Azerbaijani people is rooted in the ancient folk festivals and dances. The history of Azerbaijan theater started with spectacles “Vizier of Lankaran khan” and “Hadji Gara”, based on plays Mirza Fatali Akhundov in March-April 1873. Founded in 1928, the Theater of the Young Spectators is one of the oldest theaters in Azerbaijan. In 1936 the theater was renamed the Azerbaijan State Theater of Young Spectators. The theatre makes performances not just for adults, but for children too. The Rashid Behbudov State Song Theatre is named after Rashid Behbudov, who founded it in 1968. The building is in the Greek Revival style, with an Ionic order portico, and in the ornamented pediment there is a central lyre where the symbol for tablets of stone once featured. The theatre’s repertoire consists of folk songs, mugams and tasnifs, as well as of works of national composers. The State Theatre of Musical Comedy is one of the leading musical theatres in Azerbaijan. The premiere of Husband and wife, a musical comedy written by Uzeyir Hajibayli in, 1910 laid the foundation of Azerbaijan State Theatre of Musical Comedy. In 1939, the first Azerbaijani and Soviet musical comedies such as "Husband and Wife", "The married bachelor" were staged there. Azerbaijan State Pantomime Theatre was founded in 1994 by Bakhtiyar Khanizadeh, an actor of the Azerbaijan State Theatre of Young Spectators. The theatre has twice housed the Himjim International Pantomime festivals. As of 2009, it has toured 12 countries with a repertoire including 24 plays by both local and foreign playwrights. Azerbaijan has become the hub for much of the city's creative energy. The Land of Fire is proving that its art scene has much more to offer.